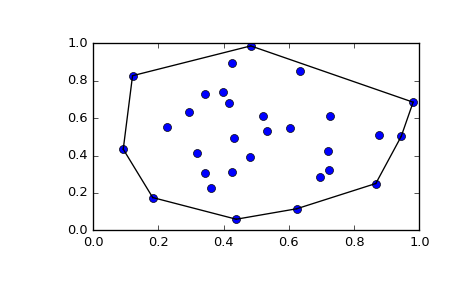 scipy.spatial can compute triangulations, Voronoi diagrams, and convex hulls of a set of points, by leveraging the Qhull library. Moreover, it contains KDTree implementations for nearest-neighbor point queries, and utilities for distance computations in various metrics. The Delaunay triangulation is a subdivision of a set of points into a non-overlapping set of triangles, such that no point is inside the circumcircle of any triangle. In practice, such triangulations tend to avoid triangles with small angles. Indeed, from the figure we see that this is the case. Qhull can also perform tesselations to simplices also for higher-dimensional point sets (for instance, subdivision into tetrahedra in 3-D). 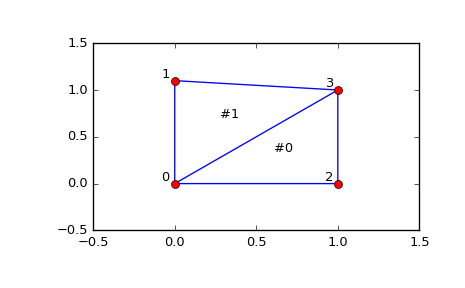 This means that point 4 resides near triangle 0 and vertex 3, but is not included in the triangulation. Note that such degeneracies can occur not only because of duplicated points, but also for more complicated geometrical reasons, even in point sets that at first sight seem well-behaved. Two new triangles appeared. However, we see that they are degenerate and have zero area. Convex hull is the smallest convex object containing all points in a given point set. The convex hull is represented as a set of N-1 dimensional simplices, which in 2-D means line segments. The storage scheme is exactly the same as for the simplices in the Delaunay triangulation discussed above. 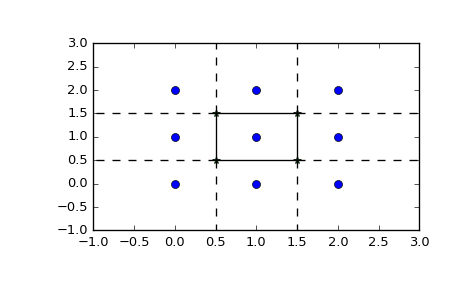 The same can be achieved with scipy.spatial.convex_hull_plot_2d. A Voronoi diagram is a subdivision of the space into the nearest neighborhoods of a given set of points. This does not, however, give the Voronoi diagram as a geometrical object. Negative value -1 again indicates a point at infinity. Indeed, only one of the regions, [3, 1, 0, 2], is bounded. Note here that due to similar numerical precision issues as in Delaunay triangulation above, there may be fewer Voronoi regions than input points. These numbers indicate indices of the Voronoi vertices making up the line segments. -1 is again a point at infinity — only four of the 12 lines is a bounded line segment while the others extend to infinity. This information, taken together, is enough to construct the full diagram. 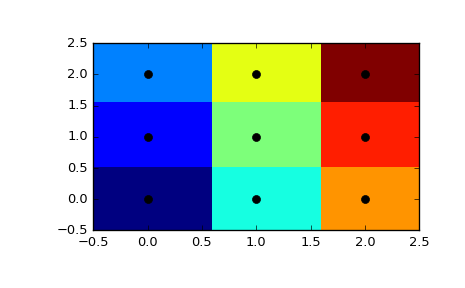 This plot can also be created using scipy.spatial.voronoi_plot_2d.